Mother’s Day is only two weeks away. So I thought I might share some ideas which hopefully will be passed on to the fathers, husbands or in-laws in your lives. This has become my go-to when it comes to note taking outside of the home. 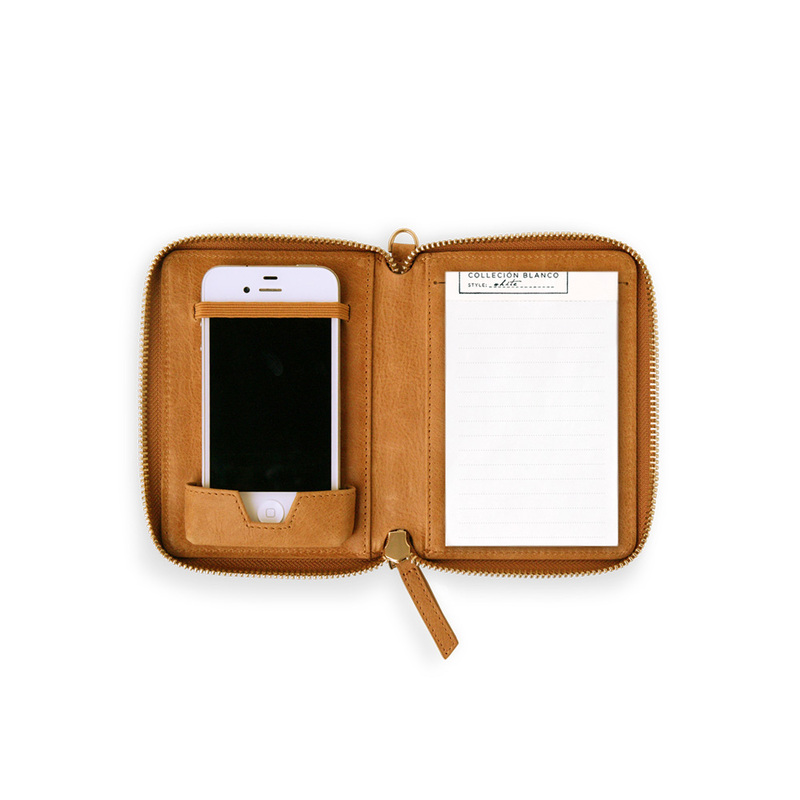 And it can easily act as a purse with the interior slots for business or credit cards. Handsome and functional. And for a mother (no mention of names) who misplaces her phone from time to time, you will always know where your phone is ringing and where you last scribbled out an appointment or two. My mother tends to subtlety “hint” at what she might like for Mother’s Day. Lucky for me, she’s in need of stationery!!! Love that kind of research. 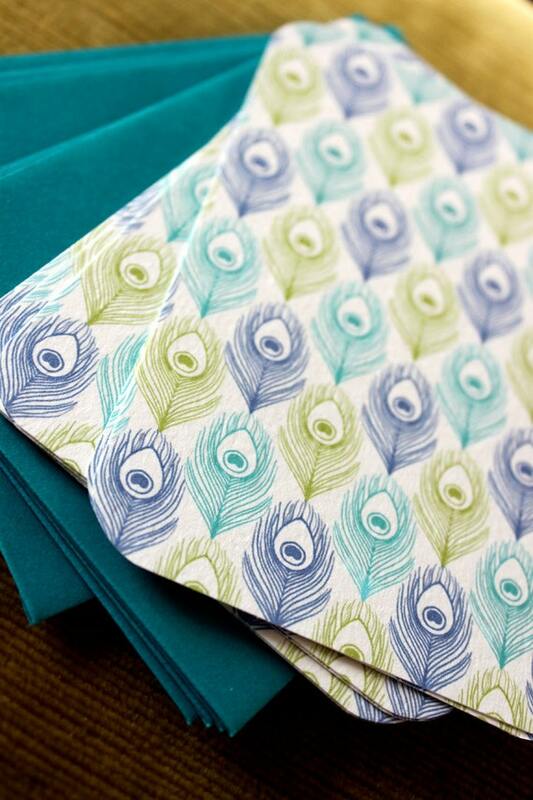 These Peacock Feather Pattern note cards from Michelle Brusegaard are lovely for a note to a loved one. I grew up near the Walker Art Center so my mother was known to reproduce art pieces which spoke to her (once she even painted a canvas orange and stuck a piece of toast right in the center of the painting). 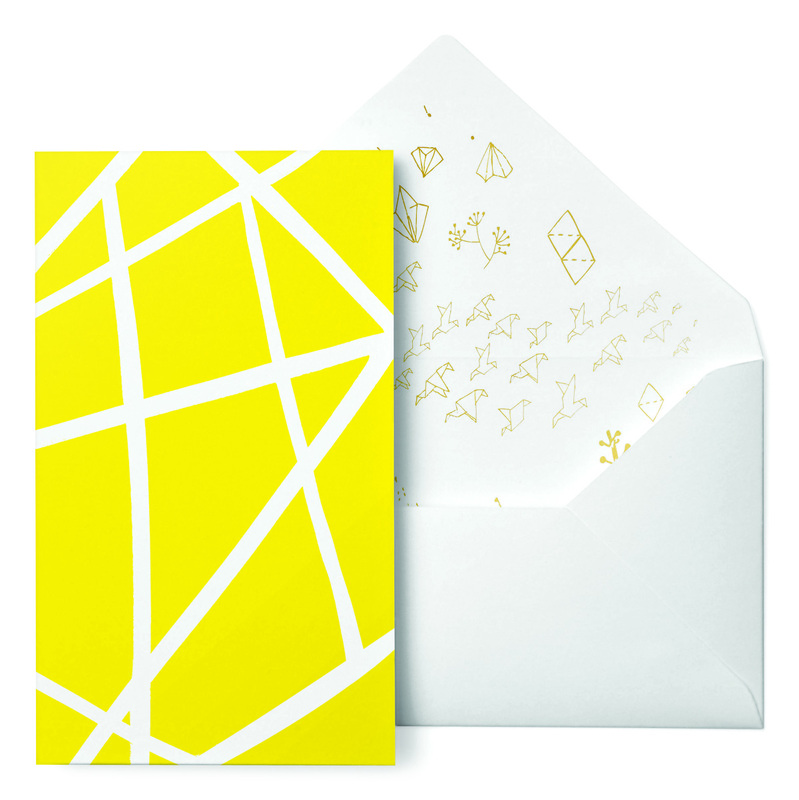 This lovely Mekko Note Card from MARA-MI reminds me of a piece she would have replicated. My mother-in-law, also a Walker fan, would easily enjoy sending these Piet Note Cards to any one of her lucky friends. 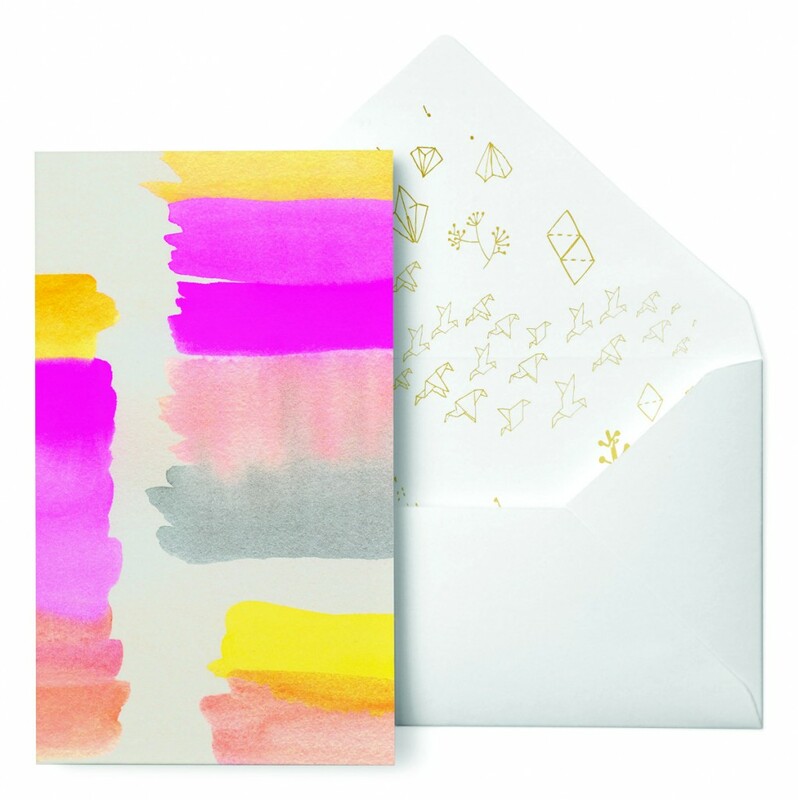 I don’t know a mother who wouldn’t be thrilled to receive these Valencia Note Cards which scream spring has arrived. 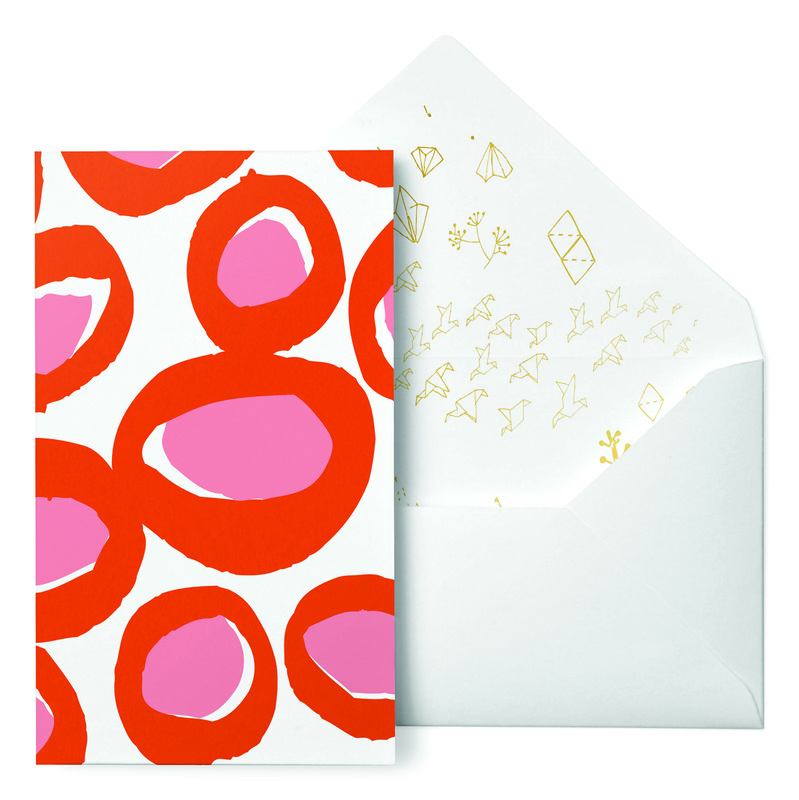 I’m crazy about this elegant, letterpress Coral note card from Fig & Tulip. Mad about the pig stamp from imm living. I mean, come on? I would find excuses to use this cute little Wilbur on any rainy day! Here’s an idea. 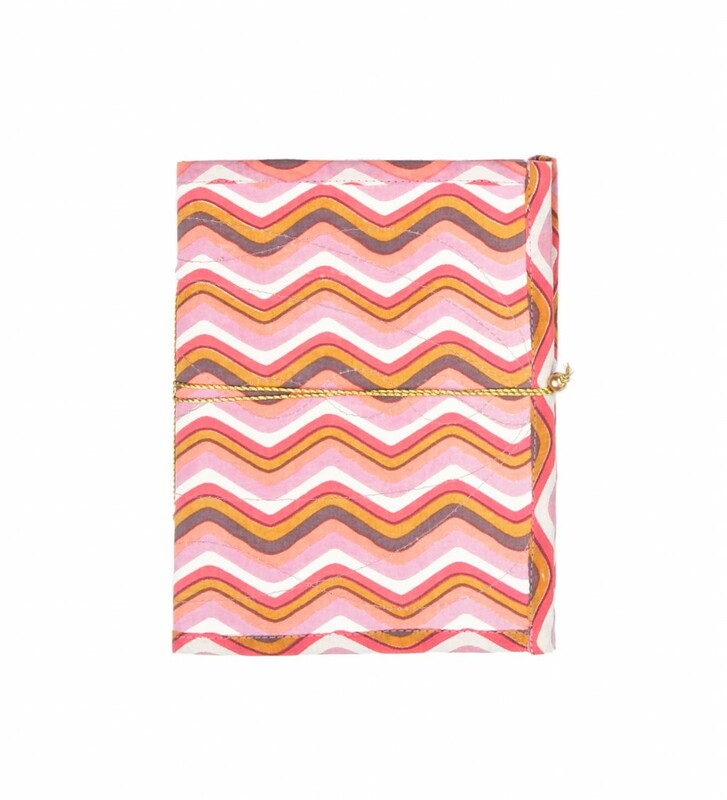 Not only surprise the mom in your life with an unexpected trip but plant the airline ticket in this handsome Traveler’s Notebook from Baum-kuchen. An unforgettable Mother’s Day gift, no doubt. 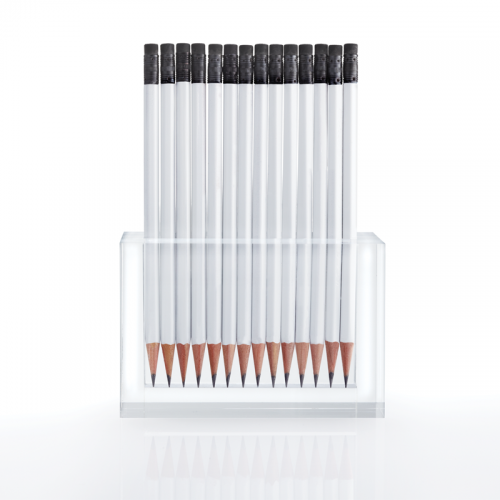 For the mom who likes to keep an orderly desk, the slick acrylic pen and pencil holder from Russel+Hazel makes your writing utensils look like art. Why not send your adult daughter a few family recipes on these copper foil recipe cards from Yellow Owl Workshop? 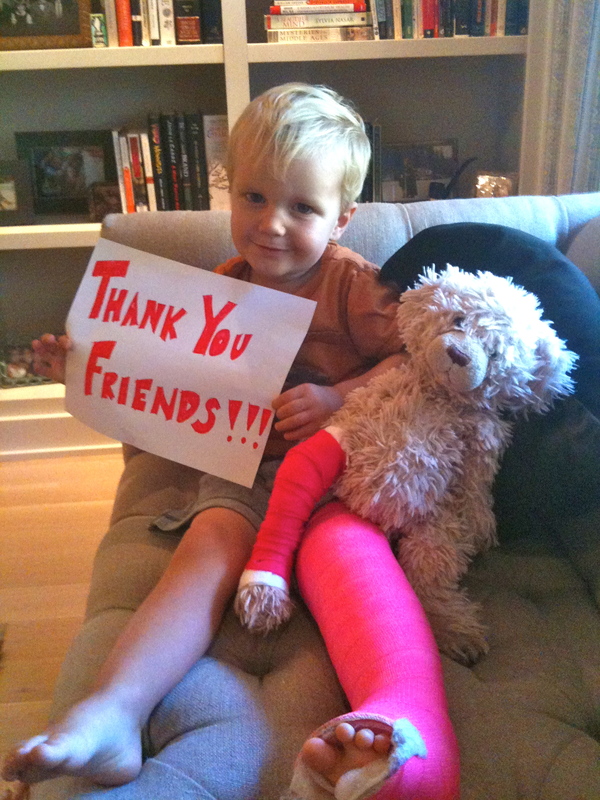 Sometimes a few words is all a Mother needs to receive. 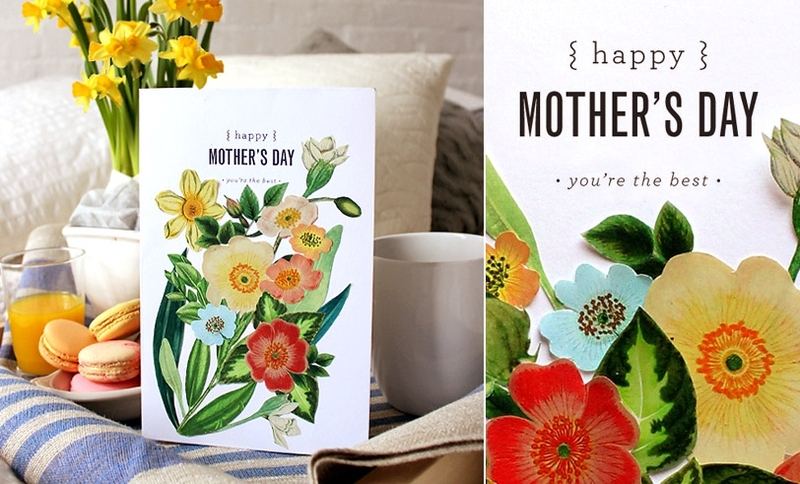 Which is why Shanna Murray illustrated decals is a wonderful gift for any mother figure in your life! I love this Blooming Mother’s Day Card from Moomah. It’s a little DIY project, possibly a perfect card from a grandchild! But when it comes down to it, we feel the written expression is the most authentic and meaningful. A Mother of any form or nature will cherish this reminder of love. 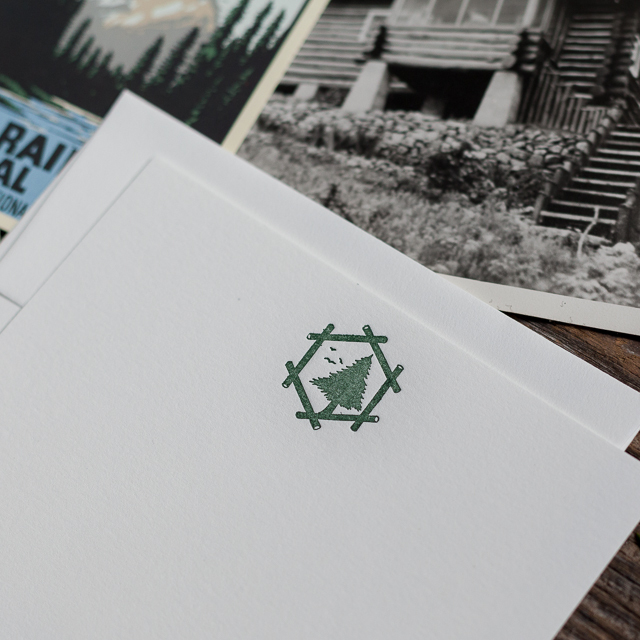 The other day while searching for future brown ink stationery needs, I landed on The Beauty of Letterpress website created by Neenah Paper out of Neenah, WI. This is an awesome site which not only supports letterpress throughout the country but praises the value of this work. However, what grabbed my attention right away was their support of the Hamilton Wood Type and Printing Museum located in Two Rivers, WI. Just to give you a little background, before I was Wendy Longacre Brown I was Wendy Hamilton Brown. J. Edward Hamilton was my great, great, great Grandfather. I knew only a little history of my family’s connection to the museum but was intrigued instantly. 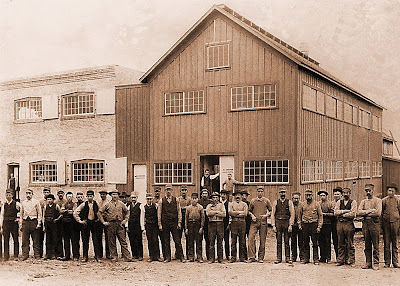 In 1880 Hamilton founded the factory and within 20 years it became the largest manufacturer of wood type in the states. What many people don’t realize is the role Wood Type played in our nation’s history. Aside from handwriting it was the main source of communication in every way from land sales to packaging to politics. The Hamilton Museum is one-of-a-kind, the only museum dedicated to preserving, studying, and producing wood type (and they continue to print today). The collection is said to be one of the world’s premier wood collections with over a million pieces of wood type and over a thousand styles and sizes of patterns. Like many businesses built years ago, the headquarters are extremely expensive to manage and the Hamilton Museum is in the process of moving to a new location. The good news is they have almost finished moving in with 20 of the 22 semi’s packed up. But of course, to keep this space running they need support. At The Beauty of Letterpress one can purchase beautiful letterpress pieces of art, support the museum directly or become a member. Looking forward to keeping the history alive with a Hamilton letterpress paper printed by authentic Hamilton wood type. Only feels fitting for me to help save printing history, family or not!! As much as I use paper on a day-to-day basis I am also aware of the consumption at home. Every few weeks a large bag or two filled with Emmett’s homework (shhh), junk mail, and used paper material sits on our sidewalk waiting to be recycled. I feel alright knowing I’m doing my part but by how much? Paper makes up the largest percentage of the municipal solid waste stream at 33%. It’s also one of the most recovered materials, as recycling opportunities are often readily available. About 34% of the fiber used to make new paper products in the US comes from recycled sources with the rest from whole trees, wood chips and scraps from sawmills. So what’s a paper lover to do? Aside from personal recycling and purchasing of environmentally friendly paper goods, one can buy tree. I’m serious. And now is the perfect time. Next Friday April 26th is National Arbor Day, when people are encouraged to plant and care for trees. And thanks to a little research from my aunt Angell, I have plenty of sites to guide you in making this decision. The Arbor Foundation makes it simple to support tree planting throughout the country, from a small donation to buying a tree. Aunt Angell is a strong supporter of all things tree-y, and is a part of Friends of the Trees of Ely, a group dedicated to supporting the life of trees in their city. For those Minneapolitans who would consider planting a tree in the parks or boulevards, do it through the Park & Recreation Board. When looking for more reasons to plant a tree, take a look at Resilience which prides itself on building strong communities. Of course, if the purchase of a tree is not in the budget, look for opportunities where trees are automatically donated such as Postography, a simple App for your smart phone. Not only do they use vegetable ink on 100% recycled paper made from 60% post consumer waste but for every 20 cards you send a tree is planted. Love an App which just keeps on giving!! 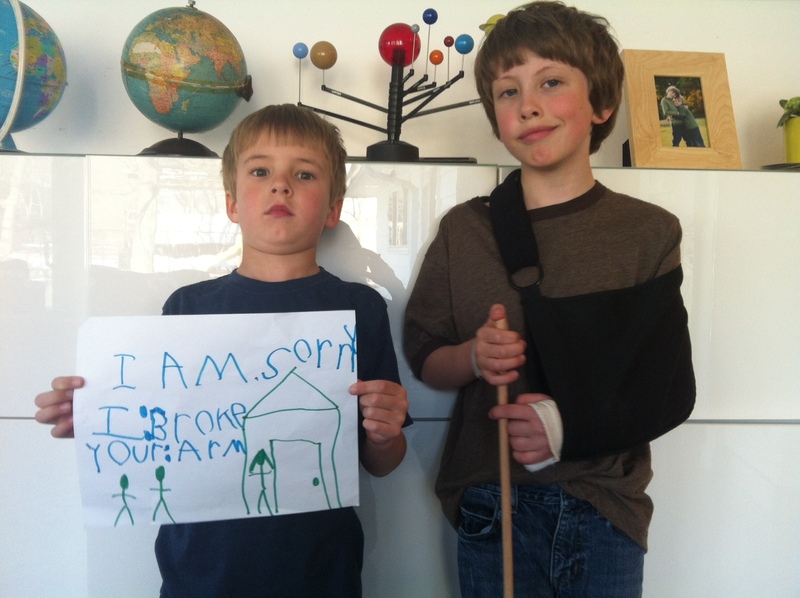 Kids these days (I can say that being almost 40, right?). Lately, I’ve been particularly delighted by the creations young adults are behind, especially when they have something to do with handwriting. Michael Polk, a young documentarian, is creating a film titled Making Mail. It’s about a group of artists who are spreading their art not just through the mail but the mail is the art itself. Michael feels, “In a world where most communication has moved online, these people have embraced the physicality of mail and turned it into an incredibly intimate art form.” How awesome. This past March the film completed its funding via Kickstarter and Michael has begun filming. We’ll keep you posted if or when it reaches the indie film circuit. Another impressive young one is Hannah Brencher, the founder of More Love Letters. I wrote about her last year and since then she has created quite the team of letter writers. Their mission is for people to move away from Twitter, email and other apps and start writing letters to those who could use (who couldn’t?) some joy in their lives. One of the aspects I most appreciate about this group is how simple it is to get involved. I just signed up to start writing love letters (no pressure on the amount, even one a month will due) and I’m also considering hosting my own writing party this summer. Finally, two 20-year-old blokes from Australia are fighting the potential death of the postcard with PhotoPostcards. They create a postcard with your photo and words, then drop it in the mail for you. Even I, currently an instagram addict, find receiving a photo postcard in the mail a welcoming change from the nanosecond travel updates I view on my iPhone. Twenty-somethings making their mark in the name of writing. Well done.